A boilermaker is a tradesperson who manufactures, installs, and maintains boilers, tanks, and closed vats. Boilers heat the liquid, usually water, that is used to generate electric power or provide heat to buildings, factories, or ships. Tanks and vats are storage containers that hold chemicals, oil, and other liquids. With experience, you may be able to move into a supervisory position. You can eventually become a project manager who supervisors other construction workers like plumbers, carpenters, masons, and electricians. Boilermakers are responsible for the maintenance and repair of boilers that may last for over 50 years. This includes ongoing inspections and the replacement of valves, fittings, feed pumps, and other boiler components. Some boilers are so large a crane must be used to move pieces while the boiler is being assembled, and a boilermaker must direct the crane operator to lift the parts into their proper place. A boilermaker's salary varies based on the area of expertise, level of experience, education, certifications, and other factors. Boilermaker jobs generally require individuals to have a high school diploma or equivalent and be at least 18 years old. Training takes place through an apprenticeship that teaches skills while on the job. Apprenticeship: If you want to become a boilermaker, you can apply to a formal apprenticeship program offered by a union or employer. It is likely to include about four years of paid on-the-job training combined with classroom instruction. Alternatively, you can attend classes at a trade or technical school and combine that with employer-provided training. Training: Certified or documented training from similar occupations such as millwrights, welder, pipefitter, or sheet metal workers, while not required, may give job applicants an edge over those with no related experience. Mechanical skills: Boilermakers must use and maintain many types of equipment, such as welding machines and hoists. Unafraid of heights or confined spaces: Boilermakers often work inside a vat or boiler, and must be able to handle working in tanks at any height, such as water storage tanks that may be several stories above the ground. Physical strength and stamina: You must be able to lift heavy equipment and spend many hours on your feet. Troubleshooting: The ability to correctly diagnose and then fix problems is essential. Critical Thinking: Boilermakers must weigh various solutions to problems and then predict which one will be most effective. 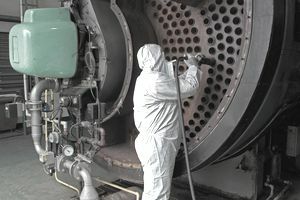 According to the U.S. Bureau of Labor Statistics, the outlook for boilermakers over the next decade relative to other occupations and industries is about the same as the average for all occupations, driven by a continuing need to replace and maintain parts for boilers, offset by fluctuations in the construction industry. Employment is expected to grow by about 9 percent over the next ten years, which is the same as the average growth projected for all occupations between 2016 and 2026. Growth for other construction trade jobs is projected to grow at a slightly higher rate, which is 10 percent over the next ten years. These growth rates compare to the projected 7 percent growth for all occupations. Job prospects will fluctuate along with the economy, as levels of construction rise and fall. Building equipment contractors employ most boilermakers. This includes heating, plumbing, and air-conditioning contractors. The working environment is often damp, dark, poorly ventilated and noisy. Jobs are typically full-time. Boilermakers work overtime when there are deadlines to meet, for example when working on a construction project. They face periods of unemployment when their employers are between contracts. Some projects may require travel and extended time away from home. Check for resources provided by your state, such as the California Apprenticeship Coordinators Association. You can find more information on how to get into an apprenticeship program, where applicants receive paid training while on the job. Look for boilermaker jobs and apprenticeships on online job sites such as Ziprecruiter.com, Indeed.com, and Glassdoor.com. Additionally, check for job listings at a local trade, community, or technical college's career center.